If you are a fan of cycling, Bogota is an ultimate destination for you holiday. There are good roads where you can ride your bike safely. You can enjoy adventurous cycling which may not be possible in your home country. 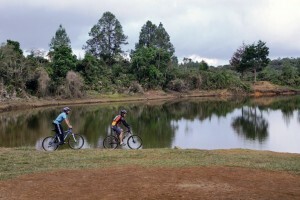 Bogota offers the best places for mountain biking and the best place for this activity is Suesca. You can enjoy an adrenaline-packed day, by cycling through the meandering paths on the high altitude. Besides, the fun of cycling, you will also be able to have spectacular views of the underlying features from the top of the mountain. For those who love to cycle, you cannot afford to miss out on this interesting adventure in Bogota. What you need to know about mountain biking? It requires skills and the energy to pull through. You can agree that it is not easy to cycle up a hilly area. Hence, it is not for the novices. In fact, the guide will give you training on the tour and safety. Nonetheless, if you are inexperienced it is best you do not go through it on your own. They will then give you a bike and the protective gear. Do not forget to pack a snack on your backpack and a bottle of water; they will come in handy when you reach at the top. A camera will also be useful. With it, you can take a few photos and send postcards back home. As said earlier Suesca provides great platforms for mountain biking. The cycling takes you through twists around the small mountains, which are located 65 km north of Bogota. Suesca is a colonial town, which has a Savannah climate. Its rugged landscape makes it appealing to mountain bikers. There are more than 300 trails. As you bike, you also get an opportunity to view the areas around the hilly region. However, it is important you concentrate on biking, lest you find yourself at the footstool of the mountains. All the same, you can still view the surrounding towns while ascending the hilly terrain with your bike. When you get at the peak, you can take a snack and enjoy great views of Suesca and other neighboring areas, before you descend. As you come down, you will splash small puddles on the trails until you are back at the starting point. If you are travelling with a group of friends, you can compete on who gets at the top first as well as moving down. When you are taking your snack at the top of the Suesca hills, remember to take a few pictures of the landscape. While there are many areas in Bogota where you can have a biking adventure, Suesca is the home for mountain biking. You can be assured that your visit in Bogota will be interesting and memorable. As long as you have the experience and the skills in cycling, you are good to go. For safety, purposes keep within the trails and you will avoid accidents. For more information on adventure trips to Colombia, contact us!